Oops, I Craft My Pants: GIVEAWAY! Want to learn to sew a bag? 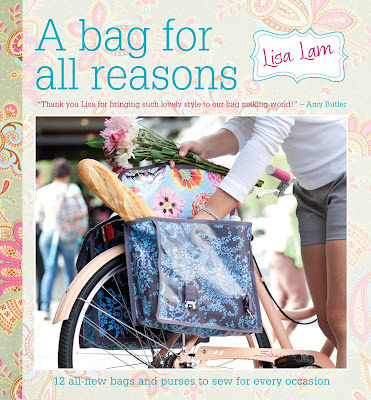 "A Bag For All Reasons" Book Giveaway! Your bag looks lovely, as does the book, very handy indeed. Fingers crossed! this book would be a great-great help!! This book looks really sweet! I would so love to win this! I have a bag obsession and it's so much less expensive to make them. Also, it's so much easier to make them when someone else provides the directions. Thanks for the chance to win a copy! I think I actually had this bag in my grubby little hands at the book store the other day. I REALLY wanted it, but I ended up choosing 2 different books on sewing clothes. the tote look very simple but awsome! It's been awesome To check into your blog to see what you're up to! I'm really intrigued by the bike saddle bag on the cover of the book. So useful and pretty fabric too! Looks like a very useful book AND bag! Would love to win. Thanks for doing this contest. Great shopping bag! I just had a look at the book on Amazon. Even if I weren't a cloth bag junkie (which I definitely am), this books looks amazing simply for the techniques and general how-tos! Thanks for the chance! I'm not much of a sewer, but I think a bag might be a good place to start, don't you? Ooh! Ooh! Ooh! Pick me! Pick me! I have looked at this book and would be sooooo excited to win it. Crossing my fingers!!!!! !